Medical professionals will march from the Montreal General Hospital to McGill University on Wednesday to push for tougher regulations on firearms. Canadian doctors, nurses and other health professionals are taking action across the country on Wednesday to urge the government to do more to curb gun violence. Montreal is one of 13 cities across the country where initiatives such as marches and letter-writing campaigns are taking place. The group, Canadian Doctors for Protection from Guns, is pushing for the passage of Bill C-71, which is currently before the Senate. That bill would expand regulations on transporting firearms and background checks, among other changes. But Dr. Andrew Beckett, a trauma surgeon at the Montreal General Hospital, says action on gun violence must go further. On CBC Montreal's Daybreak, he said the issue must also be examined from a socio-economic lens, to see what pushes people to violent crime in the first place. "We're treating this as a public-health issue," said Beckett. "We just want to see less bullet holes in our patients." The group also wants handguns and assault-style rifles banned. The event here will start at the Montreal General, with an information session from 11 a.m. to noon, where the public can learn more about the group's mission. At noon, they will walk from the hospital to the McIntyre Medical Sciences Building on McGill University's campus. 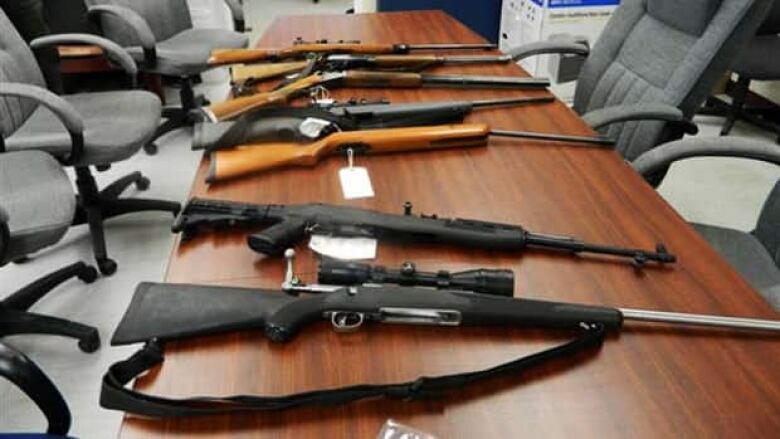 Firearm-related violent crimes have been on the rise since 2009, according to Statistics Canada, with shootings surpassing stabbings as the most common homicide method in 2016. "We often see the devastation caused by these incidents," said Beckett, who is also a Lieutenant-Colonel in the Royal Canadian Medical Service. He says the Montreal General's trauma centre sees 18 to 25 gunshot wounds a year. Quebec's firearm registry went into force this year, after the federal registry was scrapped in 2012. Facing pushback from gun owners, who said the law targets law-abiding citizens while doing nothing to curb the use of illegal firearms, the Quebec government softened the requirements of that law.